I got tricked! 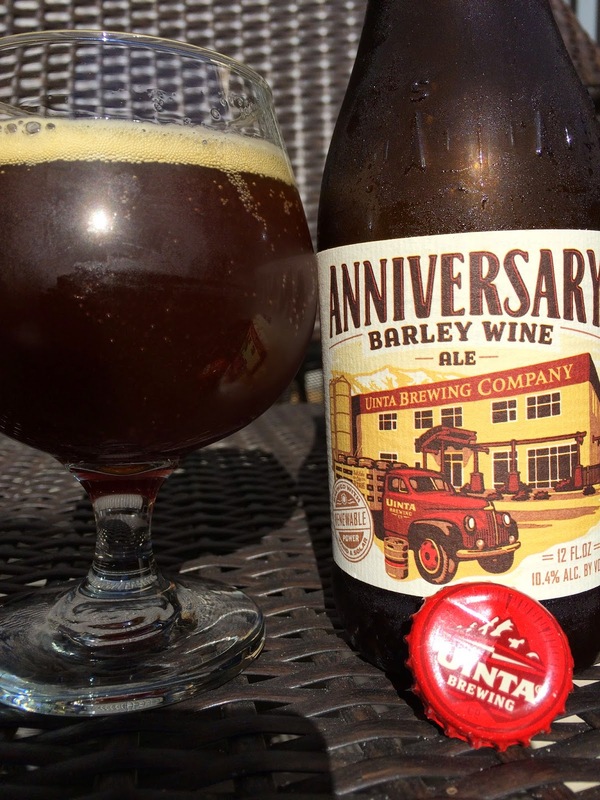 While Uinta originally brewed their Anniversary Barley Wine Ale to celebrate their 1993 founding each year, it is now a regular beer in their lineup. My guess is that's because it's really good! The label depicts an old beer truck in front of the brewery, not a truck model I'd associate with even 1993, more like 1953. But whatever, it's an attractive illustration. Best before 03/22/15. 10.4% alcohol. 72 IBU. Prune-forward aroma, sweet ripe fruit, raisins, caramel, very inviting. Sweet toffee flavors come in the beginning but are greeted with an equally strong orange rind bitterness. There's a spicy alcohol streak that repeats itself sip after sip. Caramel and raisin sweetness. Sharp citrus bitterness. Not balance, but rather sweet then bitter then sweet then bitter then hello alcohol; Repeat! Nice flavors including a long lingering toffee sweetness at the finish. Check it out, at any time of the year!